The Karbon S case for iPhone 6 by Evutec is an ultra-thin snap-on offering, made for users who like to keep their device intact without adding bulk to it. With thickness of less than one millimeter, the cover barely affects the elegant waistline of Cupertino’s flagship smartphone. Based in Walnut, California, Evutec designs and manufactures smartphone and tablet accessories by using advanced composite and recyclable materials. The latter include DuPont Kevlar and FSC certified, eco-friendly wood veneers. The Evutec Karbon S Series of iPhone 6 cases has a profile which is only 0.7mm thin. The woven Dupont Kevlar used in the construction of the cover is five times stronger than steel at the same weight. 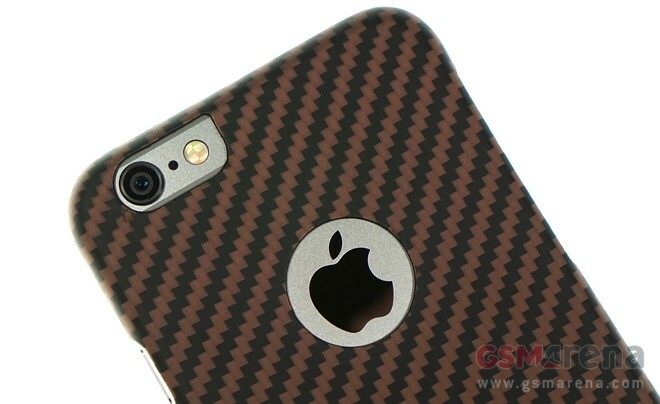 In the flesh, the Karbon S case looks like a second skin on the iPhone 6. The Kevlar finish matches perfectly the sleek design of the smartphone and is certain to appeal to many. Evutec offers the Kevlar shell of the Karbon S case in a variety of colors. They range from understated gray, all the way to not-so-subtle orange or red. You can order the case with to without a cutout for the Apple logo on the back of iPhone 6. In case, naked Kevlar is a tad too plain for you, Evutec offers an alternative to the Karbon S case in a variety of natural wood finishes. The 0.9mm Wood S series of cases is made by infusing FSC certified wood veneers with Kevlar. Unsurprisingly, having an iPhone 6 case this thin will require you to compromise on the protection it delivers. The Karbon S will do a superb job in keeping the device from scratches, but lacks any cushioning to handle serious drops. In case you drop your device often, you will probably be better off with another solution. Ergonomics of the Karbon S cover are superb. All buttons and ports of the iPhone 6 are left uncovered and easy to access, including the nano-SIM card slot. Handling is also flawless thanks to the ultra-thin nature of the case. The Karbon S case for iPhone 6 is among the best looking protective covers I have experienced. The accessory is well designed, superbly executed, and tougher than any of its ultra-thin competitors. Evutec is asking $39.99 for its creation in its official online store. If you are comfortable with the level of protection the Karbon S has to offer and have the budget for it, you will not regret your purchase. As far as ultra-thin cases go, you will be hard pressed to find a better solution than the one offered by Evutec.